Birth Date: April 1, 2016 PMY 986D Red BUF CRK The Right KindU199 Red 5L Blazin Kind 189-228Y Red 5L Firefly 1687-189 Red SSS N.K. 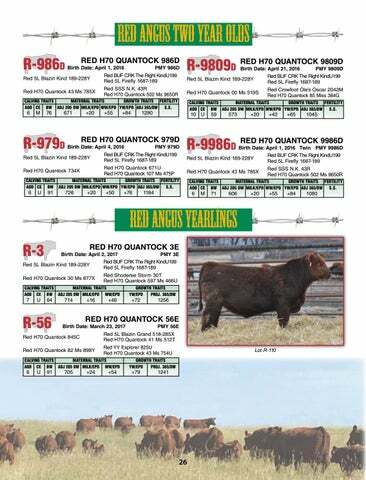 43R Red H70 Quantock 43 Ms 785X Red H70 Quantock 502 Ms 9650R calving traits	maternal traits	growth traits	Fertility aod	ce	bw	adj 205 Dw	Milk/epd	ww/EPD	yw/epd	ADJ 365/Dw	S.S. Birth Date: April 21, 2016 PMY 9809D Red BUF CRK The Right KindU199 Red 5L Blazin Kind 189-228Y Red 5L Firefly 1687-189 Red Crowfoot Oleâ&#x20AC;&#x2122;s Oscar 2042M Red H70 Quantock 00 Ms 519S Red H70 Quantock 85 Miss 384G calving traits	maternal traits	growth traits	Fertility aod	ce	bw	adj 205 Dw	Milk/epd	ww/EPD	yw/epd	ADJ 365/Dw	S.S.